Food has probably been a marker of social status since the first woman gathered more berries than her sister. It still is. Some foods are authentically posh, others undeniably lower class, and there’s no way I’m going to go out on a limb and say which is which. Because foods serve as social markers, the history of cuisine is also a history of the democratisation – some would say vulgarisation – of elite dishes, and perhaps noone has chronicled that more effectively than Rachel Laudan. Her book Cuisine and Empire: Cooking in World History shows clearly how foods move from high cuisine to low. Recently, in some places, the flow has reversed as elites have taken up what they imagine to be rustic, peasant food. The 100% wholewheat sourdough loaf, chewy of crust and riddled with large holes, became a desirable bread only very recently. As we chatted about these things, one thing became clear. There’s very little chance that food will lose its status as a marker of status any time soon. Rachel Laudan recently reworked her thoughts on bread: Why did our ancestors prefer white bread to wholegrains?. That will take you to her website and details of Cuisine and Empire. Our earlier conversation was Sugar and salt: Industrial is best. Banner photo shows poor old George IV of the United Kingdom, consuming his magnificent Coronation Dinner alone, watched by a crowd of thousands. Well, not quite alone. Aside from the onlookers in the galleries, there were about 170 diners in Westminster Hall with him and a few hundred more scattered through various rooms in the Palace of Westminster. But the King was effectively alone. 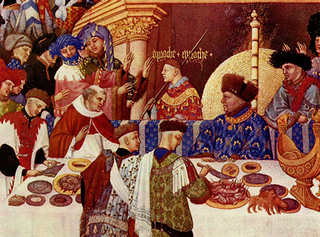 Smaller image shows John, Duc de Berry, in blue on the right, exchanging New Year’s gifts at a banquet. This was fun to listen to while making christmas dinner…. Food has always been a marker of social status, only today no elite eater worth their pink Himalayan salt would be seen dead with a slice of fluffy white bread, once the envy of the lower orders.